That pictures shows a big maple tree with two coniferous trees growing on it. If you don’t spot them: click on the picture to enlarge. That maple tree grows around 1200 meter above sea level, inside a bigger group of maple trees on the north side of the group. Because that way things are still kind of humid on the tree, it can host these two other threes. I estimate the age of the two trees between 10 and 15 years. I’m wondering how long this can continue? 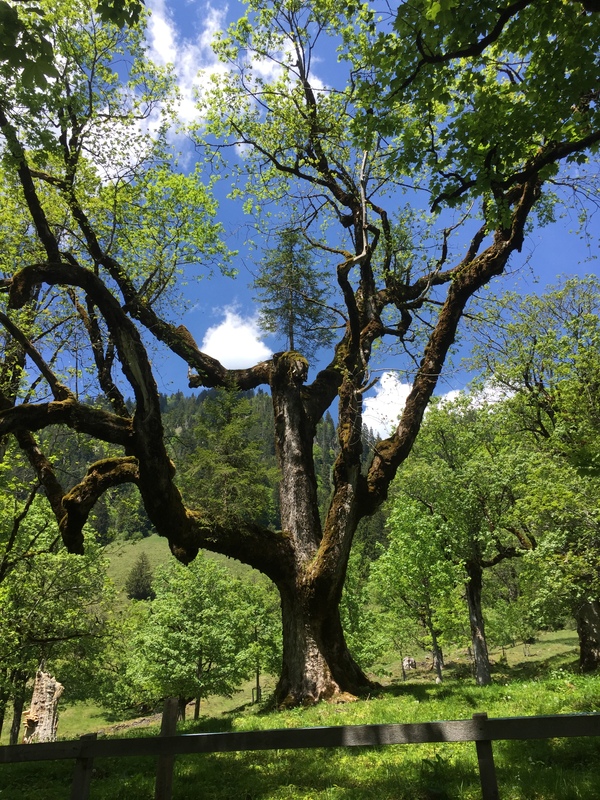 This entry was posted in Photography, Pictures, Switzerland, Thoughts and tagged Klöntal, Maple Tree, Photography, Picture, Switzerland by Erich Styger. Bookmark the permalink. That’s pretty cool. Do you think the conifer roots penetrate the bark of the maple? I imagine they must have taken root originally in the mats of moss. Yes, they have taken root in a small niche filled with moss. I don’t know if they penetrate the bark, and if so probably only lightly. It is really a beautiful place, I am very envious of your life there! That is worthy of Ripley’s Believe it or not.